We have made every effort to ensure the accuracy of the following information. No one person should perform any of these exercises without proper instruction from their health care provider. Further, we disclaim any responsibility for any adverse effects resulting directly or indirectly from the suggested exercises and exercise protocols, undetected errors or the user's misunderstanding of this information. If you are experiencing any of the following symptoms: severe sharp pain, unsteadiness on your feet, weakness, numbness, tingling, headache or dizziness, please consult you health care provider. Pendulum exercises are performed when joint movement causes pain or there is marked stiffness or limitation of shoulder movement. These exercises are gentle and progressed as tolerated. 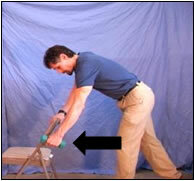 To start, use a stool, chair, counter top or fit ball to stabilize the upper body as shown to the right. 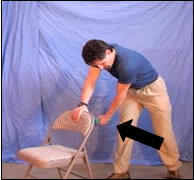 The goal is to support the back to prevent a secondary injury from occuring. Start with the good side (the shoulder without pain or less pain). 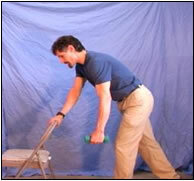 Grasp a can of soup, a 1-5 pound dumbbell or other like weighted object. Gently swing the weighted object held in your hand forward and backward with a straight arm (like the pendulum in a clock). The initial movement should be limited to 2-3 inches in each direction or as pain permits. Never swing past your tolerance for pain. Complete 10-15 swings then switch to the affected side and repeat. As your range of motion permits, increase the distance of arm swing. The next exercise is basically the same as above. This time the swing will be right to left maintaining the same cautions as above. Start with the less or unaffected side, start with small movement and progress as tolerated, and use a smooth steady movement pattern. The third exercise uses a circular pattern. Start with the less or unaffected side, start with small movement and progress as tolerated, and use a smooth steady movement pattern. Move the weight clockwise 10-15 time, switch arms and repeat. Then return to the first side and swing into counter-clockwise circles. The fourth exercise is a little more advanced and should not be performed during the initial workout sessions if there is significant shoulder pain or marked limitation of motion. The goal of any rehabilitation program is to increase function without increasing pain. This exercise uses a figure eight pattern. Start with the less or unaffected side, start with small movement and progress as tolerated, and use a smooth steady movement pattern. Move the weight in a figure eight pattern 10-15 times, switch arms and repeat.